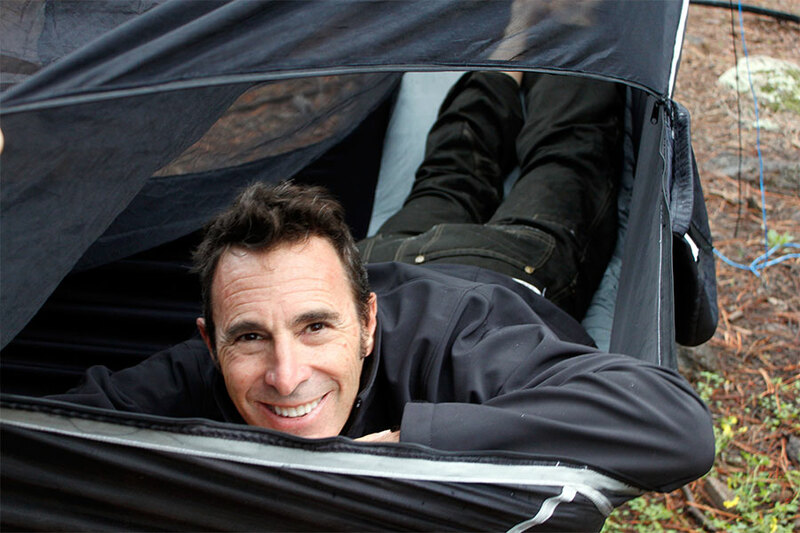 Dov Frazer, owner and “Chief Relaxation Officer” at Hammock Bliss, had a stopover in Flagstaff and invited me for another “first look” at some gear he debuted at the recent OR show in Salt Lake City: the Sky Bed Bug Free and the XL Rain Fly. The Sky Bed Bug Free takes the base model Dov introduced last year—the Sky Bed with its asymmetric design and flat lay, and integrated pad sleeve—and adds a zippered bug net. 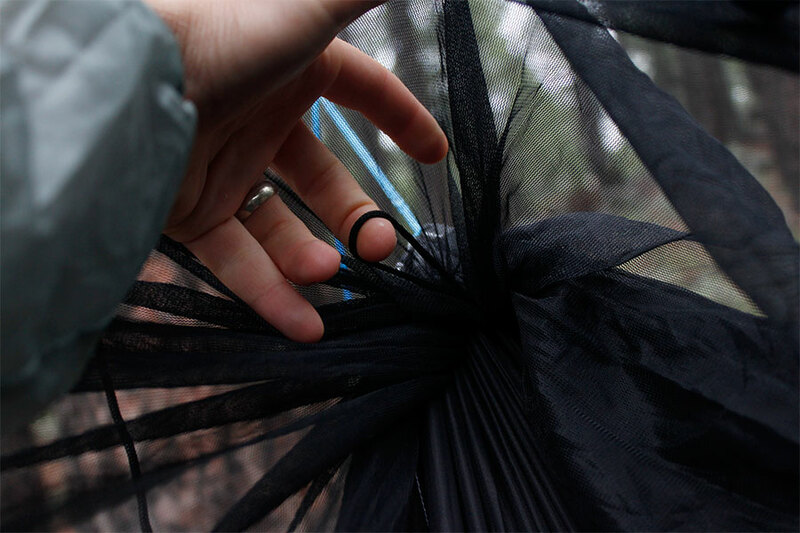 Dov pointed out a few other features that he says are present on his other bug net hammocks, including a gear loop/hook inside each end of the hammock. I would have missed them had he not pointed them out, but I’m glad to know they are there. The gear loops make great attachment points for clipping a pair of shoes or a ditty bag inside the hammock, for example. The netting is a durable 2,100 holes per square inch no-see-um netting. The target weight is around 36 oz (1 kg). 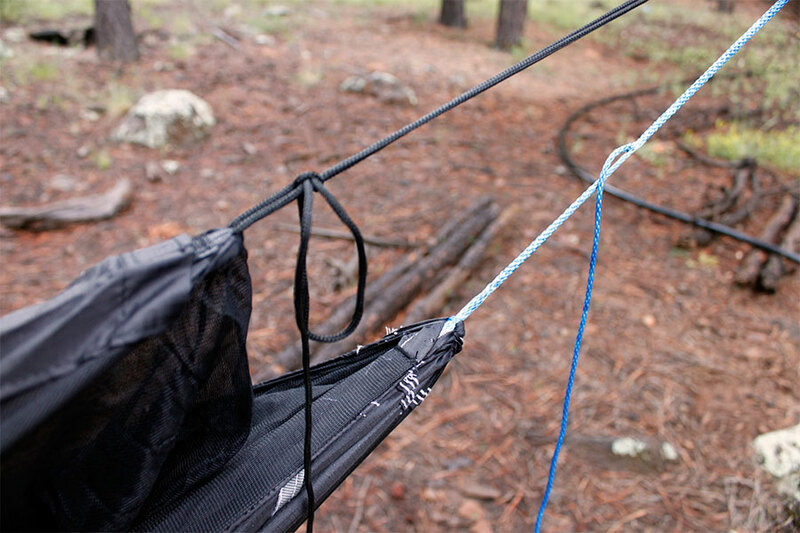 A close-up look at the gear loops inside the hammock. Dov claims he has a “flexible back,” but I think that a lot of folks will find they can lay on their stomachs in the Sky Bed. 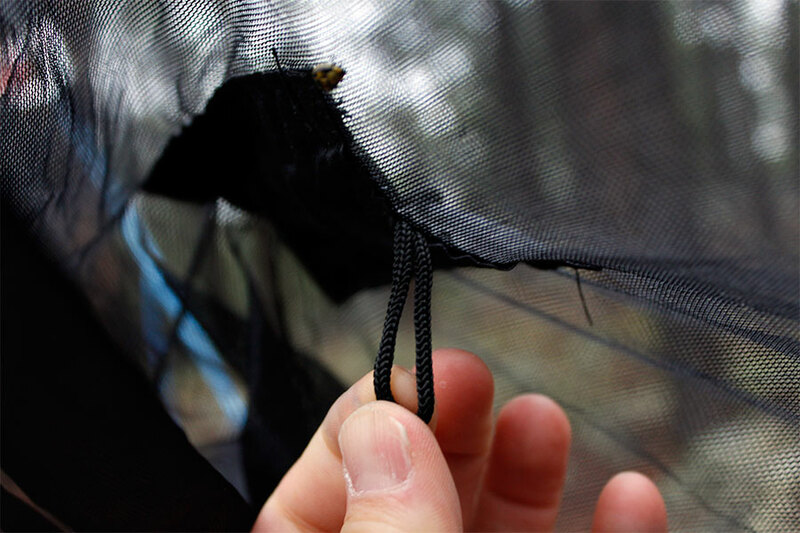 The bug net includes long tie-outs to hold the fabric up and away. 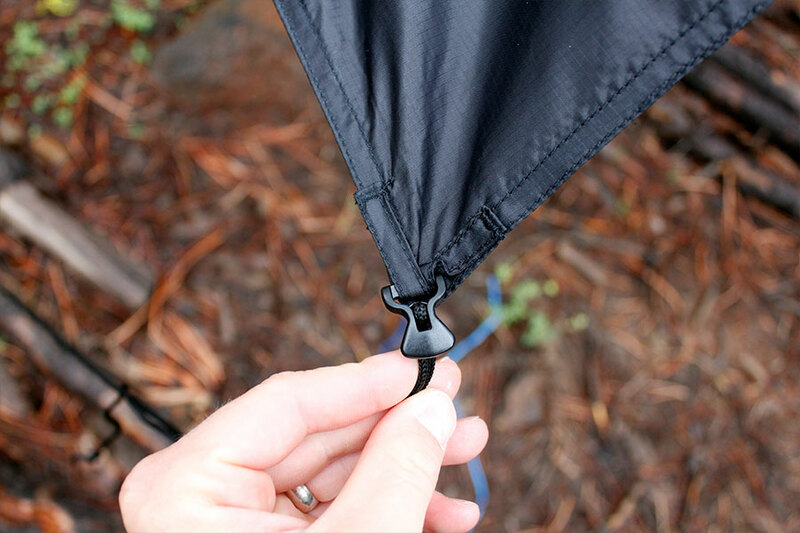 A small loop is sewn next to the tie-out so you can tie a quick slippery hitch. The Sky Bed is a really great option for folks looking for a no-nonsense camping hammock that doesn’t require you to buy a bunch of hammock-specific insulation. 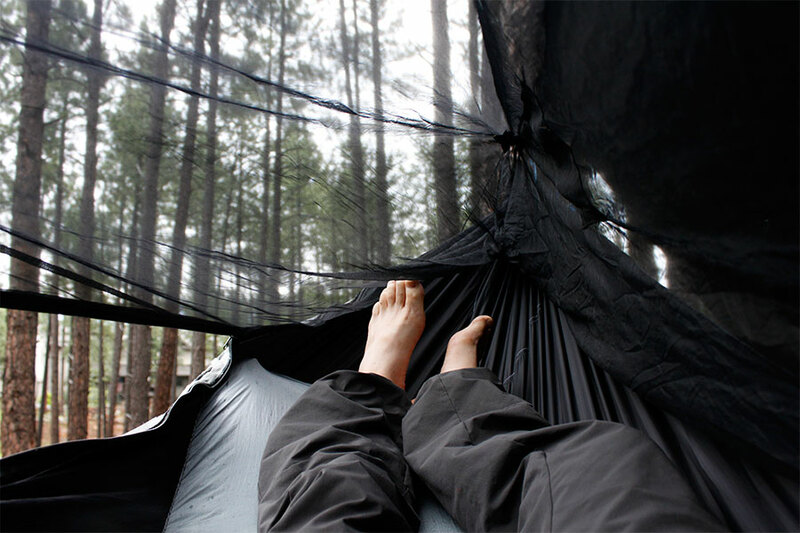 And while you can use a regular sleeping pad in any hammock, they tend to twist out. I love that the sewn-in pad sleeve holds the insulation in place, but it also improves the overall comfort of the hammock. After chewing the fat over the new hammock, I helped Dov set up the XL Rain Fly (we should have set the tarp up first as it was a drizzly day in Flagstaff). 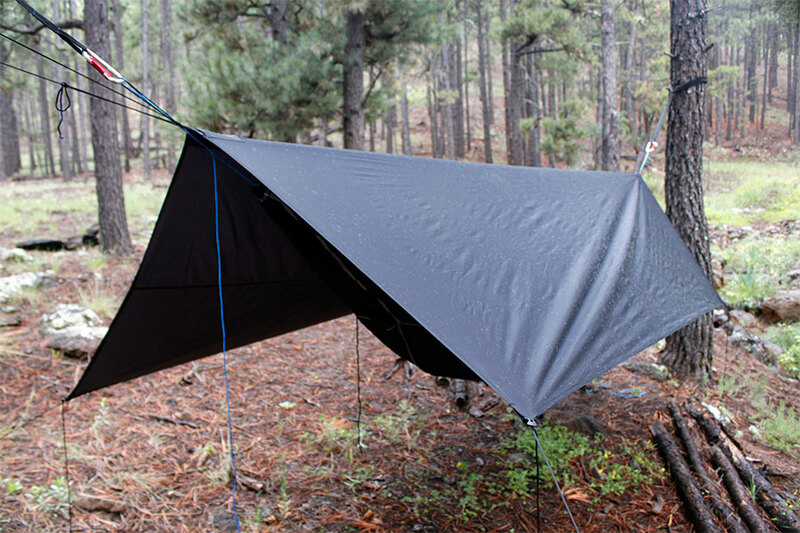 The XL is similar in design to the Hammock Bliss All Purpose Shelter but with a new, lighter DWR-treated ripstop fabric. The tarp has a basic rectangular design measuring 126 x 77 in (320 x 196 cm) and can be pitched as a diamond or as a rectangle. The target weight is around 19 oz (538 g). Dov has added new LineLoc plastic hardware for quick and easy guyline adjustment. Small pockets on the ridgeline allow the guy line to be stored when not in use. One other feature of the tarp design is that the seams are moved away from the ridgeline, which helps with water seepage seam sealing issues. The fabric is pretty chic: bold and black with a soft feel. The ripstop fabric has a DRW treatment for waterproofing. I love talking with hammock manufacturers, and Dov and I kept bouncing ideas back and forth about hammock design, fabric, and other nerdery. Dov’s philosophy is all about getting the highest quality for the best value, and I would say that he is succeeding. One thing that continues to impress me with the Hammock Bliss product line is the quality of materials and construction. Everything from the bug netting to the zippers to the stitching is made to last; I might even go so far as call it “rugged.” The gear is a good balance of weight and quality. I have no problem loaning out my Hammock Bliss gear to friends (or even my Scouts) because I know it can take some abuse and still be okay and still be light enough for backpacking trips. 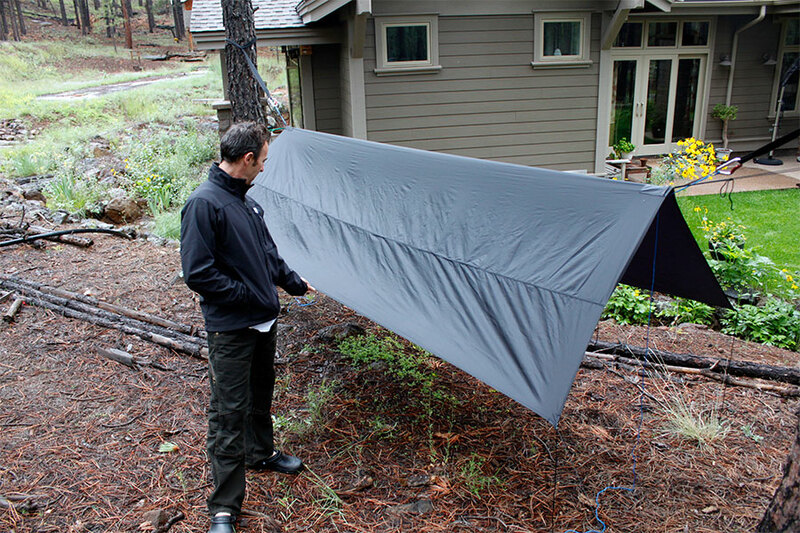 Updated material to the Sky Tent 2, using the same lightweight ripstop fabric of the XL Rain Fly. All of the items should be available November 1, 2013. As I was about to leave, Dov presented me with a few gear samples I’m looking forward to testing in the coming weeks, including his Triple Hammock, Deluxe Straps, and Sun Shield storage bag. I’d like to thank Dov and Hammock Bliss for the sneak peeks and the gear to test. Can you flip this hammock and use it with out the bug net during the day? I’m comparing the ENO JungleNest and this hammock. Any suggestions of “must haves” for a first time user? The new version can unszip farther and the bug net can be pulled away. 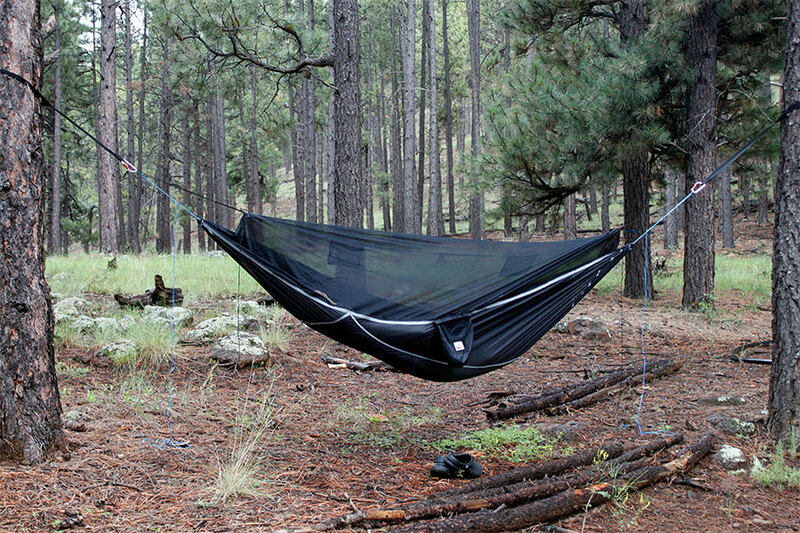 For a first time hanger, if your goal is camping not just lounging, you’ll want the bug net and a tarp. After that, it is essential to have good webbing straps to protect your hang point. I really like the daisy chain style for new hangers. The ENO Atlas straps and the Kammok Python straps are two good examples. Ticket to the Moon also has a nice daisy chain webbing/rope hybrid. How did you attach your whoopie slings to the ends of the hammock? My sky bed came with rope that I’ve removed and then looped my whoopie sling around the gathered end. Seems to hold well, but from the photos, it looks like you’ve attached it differently? Also, do you find this hammock needs a structural ridgeline? Or does the inflated pad correctly control the amount of sag without the need of a ridgeline? Thanks Alex! The hammock should have a channel in the end. This is where I feed the suspension. This hammock is very unique. You could fit in a ridge line, but it will require some deconstruction to feed through the bug netting.